Been a while, but I finally got back to it a bit. I prefer option 2 for abilities but I would keep the starting location from option 1. (12-14-2018 04:41 PM)August700212 Wrote: I prefer option 2 for abilities but I would keep the starting location from option 1. That's where I'm leaning too. I like the Portrait and Quote from 1. 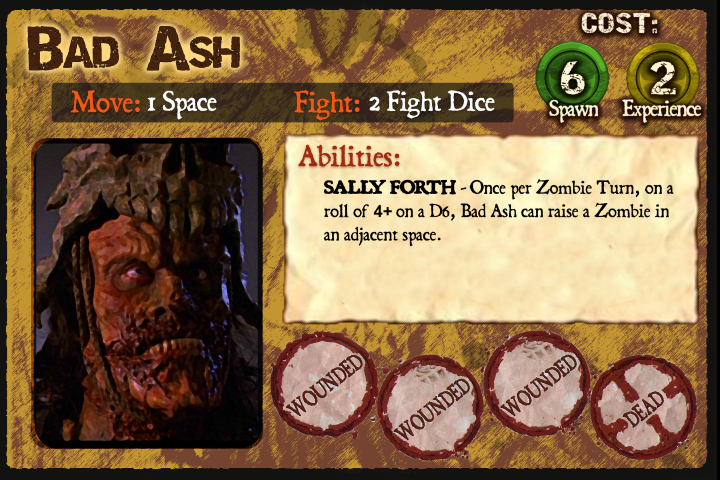 OK, so I was looking back at the post for Bad Ash, and realized that I never got around to re-working it, and I just recently discovered the Zombie Behemoth from Blood in the Forest. 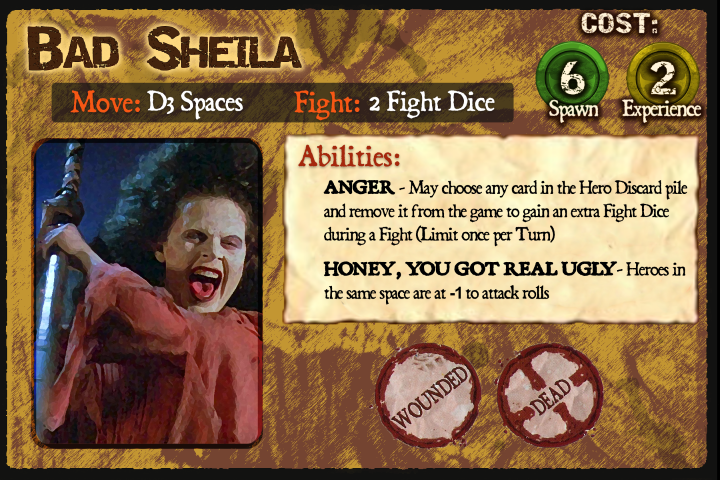 Using that Idea (Could NOT find a good scan of the original), I recreated the card style, but used the Necronomicon for the background, and came up with these. Looking for feedback! I really like the new background. The abilities for Bad Ash and Evil Shiela fit well too. 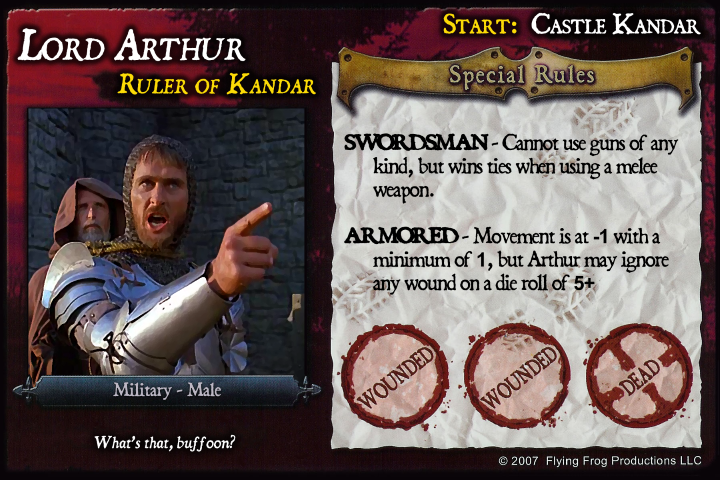 Looking back at Arthur, I like the first (pointing) pic with the castle starting space. If you wanted to give him a negative trait, it would have to be "Your Shoelace is Untied...". If I can think of an appropriate mechanic, I'll let you know. Something about his scepticism of Ash's abilities. (01-13-2019 07:07 AM)Talos Wrote: I really like the new background. The abilities for Bad Ash and Evil Shiela fit well too. Not sure if I enjoy making the content, or making the templates more! 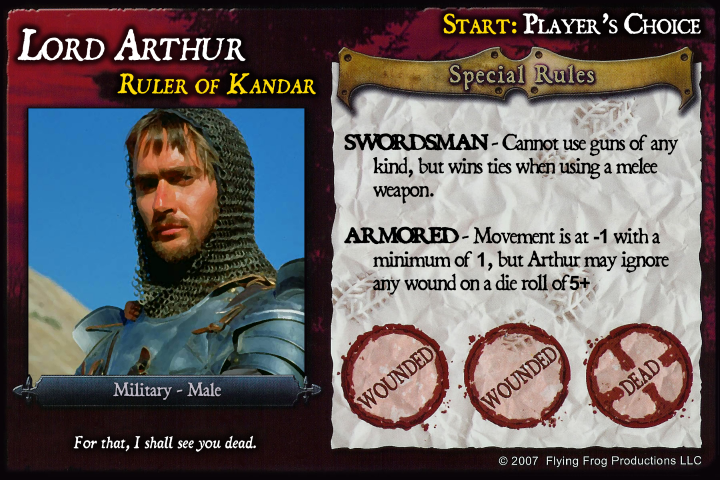 Here's the current iteration of Lord Arthur. ARMORED is kind of negative with a possibility of being positive. Ok, so here's the Blacksmith. Since the character doesnt actually have a name in any of the scripts that I can find, I decided to take some artistic license with this, and name him after the character that the actor plays on My Name Is Bruce. 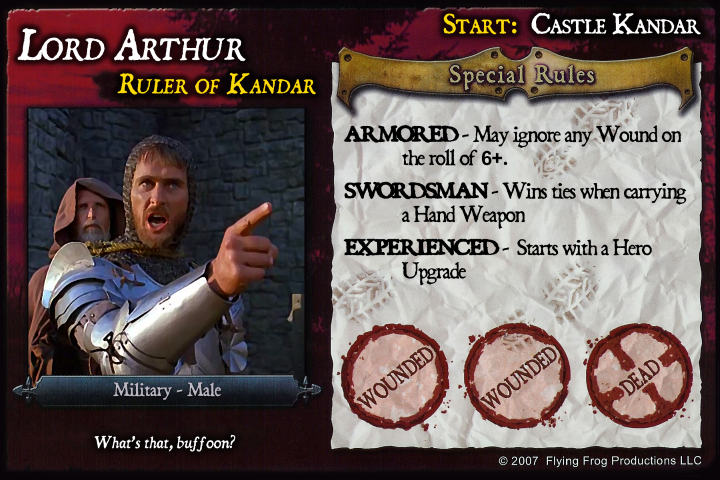 In the show the character Frank says the line "My money'd have been on that blacksmith from Army of Darkness. Now that's one stud." 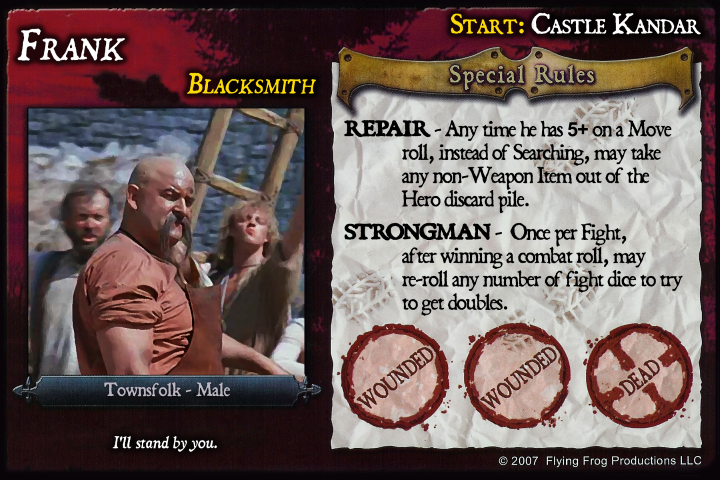 which is pretty funny, so as an homage to the actor Timothy Patrick Quill; I present Frank, the Blacksmith. I used Reurnal's ideas for the skills, but I changed the name Ha hu hay ya!!! since the Blacksmith isn't actually involved in that scene.